The Design People's leaders are as committed to delivering value to their clients as they are to encouraging team members to become the best in their fields. 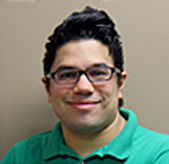 Joey Perez has been a TDP website project manager since April of 2007 and has since worked on every kind of website we have to offer. Having launched over 200 sites in his career, he is very hands-on with his projects and possesses a strong grasp of the essential tools within our various website platforms. He also adds a touch of his own design flair to every custom project he manages and pays great attention to every detail whether it relates to HTML formatting, written content, or design aesthetics. Much like all of our other team members, Joey is always happy to lend his experience to a fellow employee and prides himself in having a great relationship with both his clients and our in-house web development staff. An avid foodie, Joey’s philosophy is to try just about any food twice.